I'd not planned commentary for today. But it's appropriate - it's "hump" day and in the Marine Corps "hump" is something near and dear to infantrymen. As today's commentary includes Marine infantry thus I post in honor of those who "hump" - and every Marine, too. Yesterday afternoon, thinking that wherever Marines gather Marines are welcome, I drove 30 miles east through the desert to the Marine Corps Air Ground Combat Center (MCAGCC) in Twentynine Palms, California. At the gate, the armed Marine sentry scanned my ID card, came to attention, saluted, and said, "Good afternoon, colonel." With respectful crispness, it's custom no others do like Marines. I went to see a battalion formation - 1st Battalion of the 7th Marines (1/7) of the First Marine Division (The Blue Diamond) - on the Lance Corporal Torrey L. Gray, USMC, Parade Field. The First Marine Division Band was on hand. And the battalion turned out in the Service Alpha uniform with barracks cover - formed to honor four of their own from Company D for combat heroism. From the port side of the reviewing stand, in the shade of a large shrub, I discreetly witnessed. First Lieutenant Kenneth Conover, III and Sergeant Kenneth Rick were each presented the Silver Star. Staff Sergeant Joshua Brodrick and Sergeant Nicholas Brandau were each presented the Bronze Star with the "V" distinguishing device. The four Marines - rifle platoon commander; rifle platoon sergeant; and rifle squad leaders - were decorated for extraordinary personal actions fighting a determined enemy during six days of heavy combat (22-27 June 2012 in Afghanistan). Generally speaking, this infantry unit, these Marines, I understand. I was trained to do what they did. The difference between us is I never had to do what they did. I attended the ceremony not by invitation but out of respect for their selfless service. And, again, under the assumption of being welcome. Lieutenant General John Toolan, I Marine Expeditionary Force commander, their commander, was on hand to pin on the medals. He spoke briefly - from the heart. He first recognized that these men were made and raised and groomed by parents - he asked the parents and all kin in attendance to stand and be recognized. He thanked them. And then the general spoke to what it means to be a Marine, what Marines stand for. As examples, he highlighted - Michael Joseph Mansfield; John Glenn; Jerry Coleman. The names Mansfield and Glenn the average reader will recognize - largely for their distinguished public service. But who's Jerry Coleman? Mr. Coleman died recently. He was longtime announcer for the San Diego Padres baseball team. But he was also a superb player in his day - twice interrupting his career to fly combat missions during World War II and Korea. I'll not go into each man's noteworthy service as Marines - especially Glenn and Coleman (but take a moment to look them up). General Toolan's point was these three Marines cared deeply about being a Marine and more so for their fellow Marines (the ones who did not survive combat; their heroes). He noted that Mike Mansfield's headstone in Arlington National Cemetery lists his name and Private, U.S. Marine Corps. That's quite a statement when considering his achievements. And then the general concluded his comments with the names of a few Marines, heroes, killed during those horrific days in June, 2012 - Lance Corporal Eugene Mills; Private First Class Steven Stevens; Lance Corporal Hunter Hogan; Lance Corporal Niall Cotisears - and offered "Semper Fidelis" before taking his seat. Each of the four medal recipients said a few words - their common humble theme being they wear the medal for their Marines. 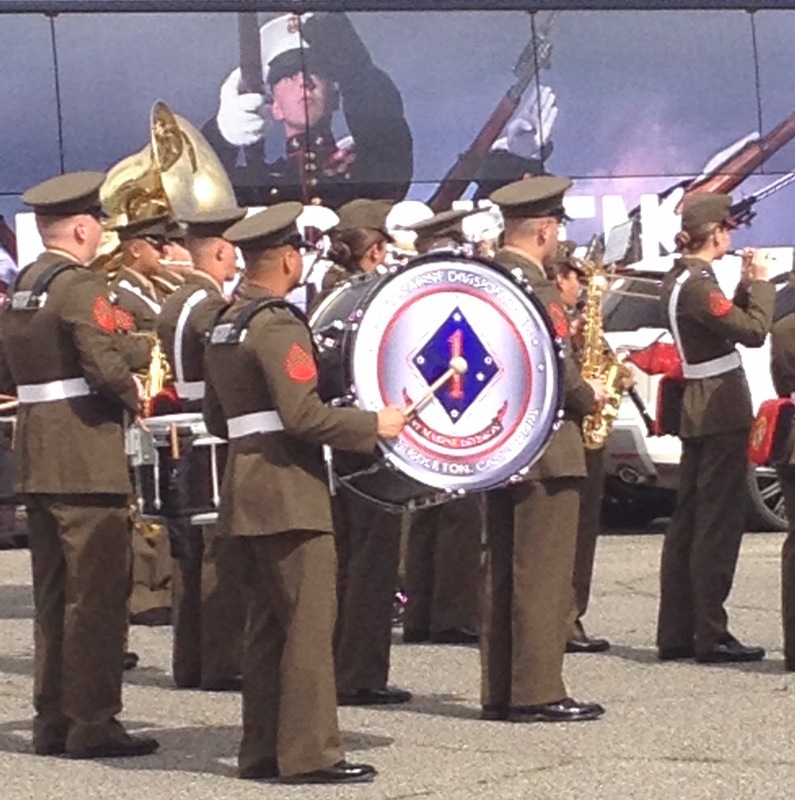 The band played the Division's traditional 'Waltzing Matilda' followed by Anchors Aweigh and The Marines Hymn. The classy ceremony that followed tradition ended. And the formation marched away. Driving home along the sparse desert highway, I reflected on what I'd just seen. I thought about more than 26 years in uniform. And what those days and Marines, Sailors too, mean to me - how being a Marine changed my life; forever. There are no adequate words. I thought how privileged to share the title Marine with those men - all of them in formation. And all the Marines they represent. What an honor. And it's for eternity. What a responsibility to live up to and to ever guard. Duty. During that interview, a not sworn conversation, the commandant broke (his) silence on the scout snipers urinating on enemy corpses case (that's hovered above him like a stormy black cloud). The commandant said he never told Lieutenant General Thomas Waldhauser (disposition authority over the case) that he wanted those Marines crushed and tossed out of the Marine Corps. He said he didn't recall - "I don't recall at all saying that". But Lieutenant General Waldhauser (known to be a man of principle, of conviction, and widely respected), in a sworn statement, said the commandant gave him those instructions - that he wanted those Marines crushed and thrown out. That's unlawful command influence. It's a big problem. And rightfully so - it goes to the core of fairness, of justice. For the commandant's comments and subsequent decisions, the case went ugly. Real ugly. And elements (that is, the future of Marines) of it, and the commandant's behavior, are still not resolved. But the particulars are not what was on my mind. What was on my mind boiled down to 'he swore and he said' and "I don't recall at all saying that". Then it occurred to me that Presidents and Attorneys General and Secretaries of State and Defense Secretaries and members of Congress "don't recall" - conveniently. Marine Corps commandants do not "don't recall." None of these men do I know. But I decided, without much thought nor hesitation at all, that with the Marine general that swore his statement and the 1/7 Marines that fought for each other and like lions am I. For with those Marines, and all alike, I share all that is Marine. Calm and peace swept me. Trust & Truth & Team. Though disappointment lingers and deep concerns nag, with those virtues, there is hope. So as a commandant, a gentleman, a combat-tested and highly decorated Marine warrior, an infantryman, of yesteryear so advised me more than 30 years ago, "Keep the faith!" With him, too, I am. I follow, dutifully. The Corps still makes Marines they way they used to. It's the making of their "leaders" that's of grave concern - especially as related to Lieutenant General Lejeune's thought "...the term "Marine" has come to signify all that is highest in military efficiency and soldierly virtue." I think we know the answer to the question "where are the generals". Slowly, but most assuredly,the cream of the crop are being relieved or retired. It is time for Marine generals to stand up,en mass, and say enough is enough. The administration could not handle this; and I'll bet the other services would follow. Not talking about a "night of the long knives". Just an effort to get us back on the right track. Who has a motive to tell an untruth? This Sir is one of the best articles you have written! I am so glad that another Marine Officer of your stature see's what I see.I served proudly in Iraq "Fallujah" and always considered myself a good honest marine.I will always be a marine regardless of who is CMC,but have been sickened by what has happened to good men because of the actions of one.i can only say " thank you" for your love of the Corps and the men who served and are serving.Semper Fidelels Colonel. Well said, sir. I recently finished Simon Sinek's book "Start With Why" (which I'd like to note is on the Commandant's Reading List) and one of my major take-aways was the absolute relevance of authenticity in our business. Essentially, it boils down to institutional integrity: do WHAT we do and HOW we do it fall into line behind WHY we exist? More and more, I'm not seeing it. The policies and directives coming from our general officers do not mesh with our much-touted ethos, which includes concepts like our core values, "every Marine a rifleman," institutional frugality, and mission tactics. Instead, we see the opposite, and HQMC can't seem to figure out why we're hemorrhaging talent from our NCO and junior officer ranks. It's terribly disappointing and disheartening. The Marine Corps has fought and destroyed every enemy it has faced in over 238 years - but can we survive ourselves? Semper Fi.